If I'd run a hostel, this is what I would want. Absolutely lovely. Couldn't ask for more. Booked another night straight away. Love this hostel so much! Hair dryer, shampoo, body wash, small towel, bed linen all provided! Polite staff! 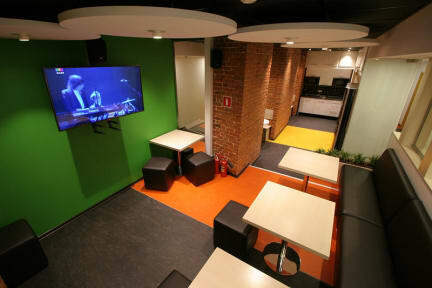 Loving the environment in hostel! Super clean kitchen! Great hostel. The charge for leaving the bags and the absence of stove could be different, but overall a good place. Great place to stay! Really friendly and helpful staff, with comfortable clean rooms located in a great part of town. Atmosphere is pretty lacking and also I'm 65% sure I saw a ghost..
Great location on a lively pedestrian street, and nice, new furnishings. Close to metro and walkable to Red Square. Note that luggage storage comes at an hourly rate, so not ideal for late departures. There’s a long list of rules that need to be signed off on check-in (no alcohol inside, additional costs for late check out, no guests etc), so this is certainly not a party hostel. The wi-fi mostly doesn’t work in the rooms, and is slow in general. The atmosphere is cold, and you can hear the metro passing under the ground. Just for one night hostel, I stayed for 4nights, totally too much. No breakfast included, no fires in the kitchen, no supplies like salt, sugar or tea, meaning that You can’t cook. Everything you add is for payment. I didn't enjoy my stay here. This is a hostel with no atmosphere whatsoever. When you first arrive they have two pages of rules you have to sign on. All they give a s*** about is their rules. Rooms are tiny and feel stuffed, although they are organized. NO WIFI in rooms was quite annoying. Also note that you can hear and feel the metro under the hostel every 5 minutes. Most staff members were unfriendly. I came for the location but it's in the middle of the tourist trap area, so not the best.